Oliver DeMille is the founder and former president of George Wythe University, the chairman of the Center for Social Leadership, and a co-creator of Thomas Jefferson Education. He is the author of A Thomas Jefferson Education: Teaching a Generation of Leaders for the 21st Century, and The Coming Aristocracy: Education & the Future of Freedom. Oliver is dedicated to promoting freedom through leadership education. 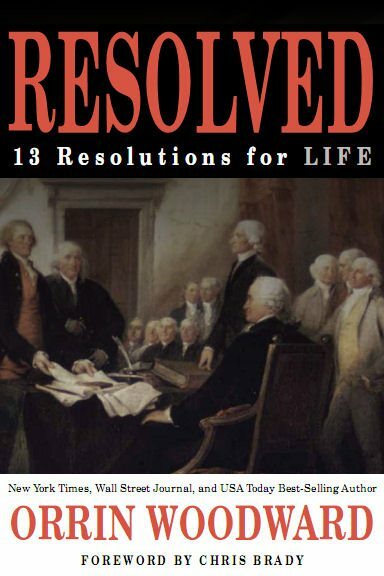 Please take the time to read Oliver DeMille’s review of LIFE founder Orrin Woodward’s new book, Resolved: 13 Resolutions for LIFE. The freedom of any society is directly related to the quality of books that are widely read in that society. That said, there are some books everyone should read, like The Federalist Papers and Democracy in America. * And in a society like ours where we are desperate for more leaders at all levels, truly excellent books on leadership are vital to the future of freedom. I recently read a book on leadership that everyone simply must read. It is Resolved, byOrrin Woodward. I’ve read Woodward’s books before, so when this one arrived in the mail I put away everything else and read it straight through. It kept me up most of the night, and it was so worth it! This is a fabulous book on leadership. It outlines 13 resolutions every person should make in our modern world, and gives specific helps on how to turn them into habits. Indeed, this book could be titled The 13 Habits of Success and Happiness for Everyone. The stories and examples from great leaders of history and current events are moving and uplifting. I literally have never read a better book on leadership than this one. It is truly a revolution in leadership books. The 13 resolutions are exactly what we need leaders to adopt across our society. They are applicable to family and home leadership, community and business leadership, and societal and national leadership. They apply to the United States and other countries, and together they form a blueprint for renewing America and innovating a new and better Western Civilization. The book is divided into three parts: private resolutions, public resolutions and leadership resolutions. Each of the 13 resolutions build upon each other, and together they create an effective and motivating system of becoming a better person and leader. They help the reader improve in career and in societal impact. This focus on societal leadership is both timely and profound. In the 1950s we experienced a major “leader-shift” in society. Before World War II, most communities were led by professionals—doctors, lawyers, teachers, accountants, etc.—and before that by big landowners and even earlier tribal chiefs. The management revolution started by Edward Deming and popularized by Ray Kroc changed the focus of leading society from professionals to managers. This was captured in William Whyte’s great 1956 classic The Organization Man. By the 1980s another major leader-shift occurred, this time from management (“do things right”) to leadership (“do the right things”). The great transitional classic of this shift was The 7 Habits of Highly Effective People by Stephen Covey. It outlined 7 habits that leaders needed in order to help their companies excel, and these habits became part of the mainstream language: for example, “Be Proactive,” “Think Win-Win,” and “Synergize.” Another great classic of this shift was Synergetics by Buckminster Fuller. The leadership revolution brought a whole new vision of what is means to be a leader. Today we are witnessing a similar leader-shift, this time from leadership of organizations (“do the right things”) to leadership of society (“move society in the right direction”). Woodward’s Resolved is a seminal classic in this change. In fact, some of the early books in this change include Launching a Leadership Revolution by Orrin Woodward and Chris Brady, The 8th Habit by Stephen Covey, and Primal Leadershipby Daniel Goleman. Woodward is more than an author; he has actually put these 13 resolutions to work in his business leadership. For this leadership, Orrin Woodward was named the 2011 International Association of Business’s Top Leader of the Year Award. His bookResolved outlines how we can all become such leaders. In Resolved, Woodward shares a host of ideas and effective means of using family, business and societal leadership to impact the world. For example, he shows how Gibbon and Toynbee taught the laws of decline that are now attacking our culture and modern free nations. He shows the three types of freedom and why they depend on each other—and how the loss of one is actually a loss of all. He helps leaders understand how freedom and character are inseparable and at the root of all societal progress and therefore leadership. His model of “Leadership Legacy” alone is worth the price of the book, and adds a whole new dimension to leadership literature. Woodward adds several other new models to the leadership genre. He shows how five important laws from science, economics and history (Sturgeon’s Law, Bastiat’s “Law,” Gresham’s Law, the Law of Diminishing Returns, and the Law of Inertia) are combing in our current world, and what leaders need to understand and do about these five laws—individually and collectively. These five laws are already part of our mainstream culture, but the analysis of how they are working together and what future leaders must do about it is new, deep and profound. No leader can afford not to understand this cutting-edge thinking. On a stylistic note, Woodward consistently uses fascinating quotes, ideas, stories, historical examples and even one equation in ways that make the reader see things in a whole new way. For example, he puts an intriguing new twist on Chaos Theory, the Butterfly Effect, a poem by Yeats, Systems Theory, the writings of C.S. Lewis and J.R.R. Tolkien, credit card usage, American Idol, the “TriLateral Leadership Ledger,” the IBM way, Aristotle on true friendship, and many other delightful references from every field of thought –all written in a highly understandable and enjoyable way. There is so much more. In one example, Woodward quotes G.K. Chesterton after he was asked to write an essay on “What’s Wrong with the World?” Chesterton wrote simply: “Dear Sirs, I am. Sincerely yours, G.K. Chesterton.” This, in summary, is whatResolved is all about. The rest of the book, all 13 resolutions, teaches us how to effectively become the leaders the world needs—and that we were born to be. Gandhi taught the same sentiment when he said that we must be the change we wish to see in the world, and Woodward quotes Confucius in saying that those who want to improve the world must ultimately focus on bettering themselves. Buddha is credited with saying that our purpose in life is to find our purpose in life, and then to give our whole heart and soul to accomplishing this purpose. Perhaps no generation more exemplified such leadership by example than the American founders, and Woodward discusses them and their words (especially Washington and Franklin) at length in showing us how to become the leaders we meant to be. Woodward also shows examples of effective leadership from such greats as Sam Walton, John Wooden, Ludwig von Mises, and Roger Bannister, among others. I could go on and on. Resolved really does, in my opinion, mark a leader-shift to a whole new level of leadership training for the new Century. If you are only going to get one book on leadership, this is the one. What a great book. Our whole society needs to study more about leadership, and apply what we learn. Awesome book! Great article !